THE EMPIRE OF NOD IS UNDER ATTACK! Once during the reign of every third human emperor, the dragons of Nod invade the Imperial territories, wiping out entire cities and expanding their borders. In ages past, heroes have risen up to face the dragons; and every time they have met with utter defeat. No one within the Empire of Nod knows why the dragons have kept this ritual, but all have come to accept it as hopelessly inevitable. 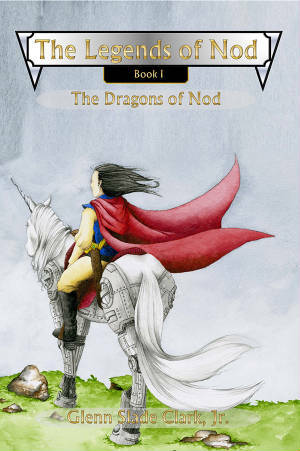 Now that the dragons of Nod have returned once again, the fate of the borderlands rests in the hearts of two unlikely heroes: Prince Joryn, the youngest son of the human emperor Sapros, and a one thousand-year-old bionic unicorn named Illium. Together, these two friends set out on a journey into the heart of the land of dragons, hoping to rescue a beautiful prisoner, stave off the destruction of the borderlands, and bring a lasting peace between humans and dragons—but for all their troubles, they must set out with the near certain understanding that the only thing they may be granted in return is death. Cover art by Molly Fine.